Bobbito Garcia also known as DJ Cucumber Slice, Kool Bob Love, is a DJ, writer, streetball player/coach/announcer, and member of the Rock Steady Crew. He recently hooked up with PUMA to release special editions of the PUMA Clyde and the Suede Mid silhouettes. Both silhouettes comes dressed in Fall-inspired colors with the Clyde features a Grey and Burnt Olive with “Guard Up” printed on the inner side. The Suede Mid sports layers of Brown and Burnt Olive with words that read “Where’d You Get Those?” on the collar. 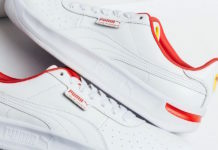 Check out the latest Bobbito Garcia x PUMA collaboration below and find both pairs available now at select PUMA retail stores, including shops like Sneaker Politics.